This one–of-a-kind reference manual includes regional pests, high-resolution images, and the latest control procedures.is a must for every pest management professional, food safety manager and other individuals involved in pest management programs. 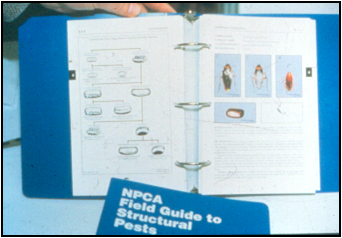 unique, 800-page reference source includes detailed information on nearly 200 different structural pests: ants, bees, cockroaches, flies, spiders, termites, and more. Illustrated with nearly 1,000 color photos and drawings and supplied with quick reference tabs and a ruler, the guide includes details on pest recognition, biology and control.